Get to west London to see the Blues. Chelsea are looking for a new home but you’ll find yours at Stamford Bridge. Take your place among the crowd and feel the passion run through your veins! Join the hearty renditions of terrace anthems “Carefree” and “Ten Men Went To Mow…” as the Blues are urged to victory by your like-minded supporters. There’s no greater atmosphere than the one they whip up on the banks of the River Thames and if it ever feels like it may be dropping below boiling point, Antonio Conte is there kicking every ball on the touchline, inspiring the crowd with his own passion for the club. A short tube ride from London’s West End and major tourist attractions, a visit to Stamford Bridge is the perfect afternoon in one of the world’s greatest capital cities! If you are interested to learn how to get Chelsea tickets then look no further. We’ve got Chelsea football tickets available for many of their most important matches both at home or away. Away fans used to taunt Chelsea that Stamford Bridge was falling down; now they’re right! The club’s plans to redevelop the stadium situated on the banks of the River Thames were approved and work is set to start in 2018. Antonio Conte’s side were by far and away the best team in the Premier League in 2016/17 and worthy champions. With Antonio Conte ready to spend heavily in the transfer market, who would bet against them retaining the title? This is the football Roman Abramovich craved; flowing, dynamic and always exciting. Seating Category – there are differences in prices between the various seating location you choose and it’s all about your personal preferences. Some fans wouldn’t go for less than the Club level/Hospitality tickets, and some would want specifically to be seated in the Long side central lower tier to see everything from up close. Others would feel great viewing the entire ground from the Long side upper tiers. Chelsea operates three ticket categories: AA, A and B. Category AA is the big matches: local derbies or top clubs such as Manchester United and Liverpool. These are the most popular games, and in the secondary ticket market, these prices can rise to more than £100 during a typical season. When the Blues are doing well, tickets are harder to come by so the prices rise significantly. Category A games are matches where the opposition is mid-table in the Premier League, along with the later rounds of the FA Cup and most Champions League fixtures. The club fixes the ticket category for knockout competitions at the time the draw is made and on a round-by-round basis. Just because the last round was category B or A, doesn’t mean it won’t be higher next time around. These are the most readily available tickets in the secondary market with the prices starting from as little as £50. Category B matches are the rest. The weaker teams and EFL Cup matches, although you will see a lot of these tickets in the secondary market, there are fewer of the games each season. If you’re lucky, you might pick your tickets up at a little over face value. 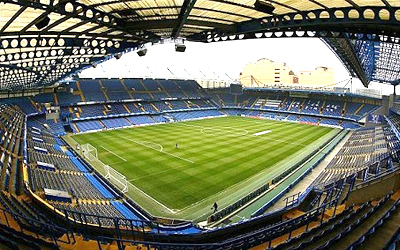 There are four stands at Stamford Bridge. The long sides are called the East and West stands. The West Stand was originally built in the 1970s and caused all of Chelsea’s problems. Every cloud has a silver lining; it was this disastrous stand which led to Roman Abramovich taking over and the club’s Golden Age beginning. The opposite side of the ground to the tunnel, you’re the first fans to see the players emerge from the dressing rooms at the start of the match! You get a fantastic view of the pitch from each seat and being close to the pitch, a feeling of being on top of the action! Called the East Stand, the second long side houses the tunnel, dressing rooms, hospitality suites and the director’s box. These are the best seats in the house, and if you’re lucky enough, you’ll be close enough to the dugouts to let Antonio Conte know what he’s doing right or wrong! The first short side, the world-famous Shed End. It used to be the favoured terrace by Chelsea’s feared fans but now this is where away fans congregate. Half the stand and the corner between the Shed and the East stand, totalling around 4.5k tickets for visiting supporters. Finally, the second short side is given over to home supporters. It’s here that the passionate atmosphere is generated with the players acknowledging the support from the lower tier which is virtually on the pitch. Known as the Matthew Harding Stand after the club’s former director who died tragically in a helicopter crash. Stamford Bridge is a compact stadium. The tiers are quite steep, so supporters are close to the pitch, but there are limits to this. If you are in the back half of the Upper Tiers, binoculars are a good match day accessory; you see the pitch and numbers on the players’ shirts but not the reaction on their faces. There’s a great mix of supporters. From day-trippers to season ticket holders with families as well and the atmosphere is more chilled. Singing isn’t frowned upon, but more noise is generated from the lower tiers. The best view is from the long side opposite the tunnel, in the West Stand. You’re the first to see the players emerge and definitely match ready before the rest of the stadium. If you like your atmosphere white hot, this is the place to be. You’re so close to the pitch that you feel like you’re winning every tackle and scoring every goal. And if anyone doesn’t believe that you’re going to the match, you’ll be seen here as the camera pans around the ground. The best seats to be a star of the small screen are by the dugouts although Antonio Conte’s sprints down the touchline mean anyone is going to be seen in the East Stand. If you like the tension of sitting next to away fans, the lower tier in the Shed End is for you, but like the good old days, you’ll be on your feet more often than not. As Chelsea attack, the fans are on their feet, urging the team forward. 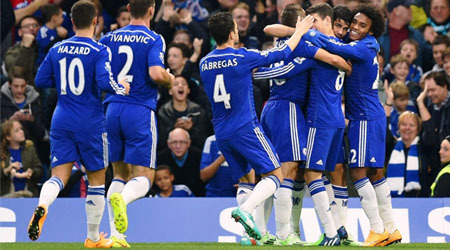 How to Buy Chelsea Tickets Online? Your best chances are in the secondary market. You have a variety of available categories. Pairs of tickets are also available (WoW guarantee them for all categories expect Singles – needless to say), for more than a pair or groups – contact us – we have it available in several categories but not on all categories and not at all times. However, you should be able to find seats in the same block, reasonably close together. For Cat AA, you are struggling but also for games such as Arsenal, where there is a fierce local rivalry. And you never know your luck; Chelsea supporters can be accommodating and willing to swap seats with you – it’s a case of being lucky on the day. Select your Chelsea fixture from our events table above or our match menu. You can buy for Chelsea home games or away tickets. In the review your order page you will be able to review Chelsea tickets that you have ordered and the total price you will be paying in the next stage if you have been given a coupon or discount code, enter this in the box and click “apply”. The final Chelsea ticket prices will be calculated and then click “Proceed to payment”. There are no hidden fees, or costs and the total price you see are what you will pay for Chelsea football tickets. After payment is successfully processed, you will be redirected back to our site, and you will receive a confirmation message. An email with your Chelsea ticket order details will be sent to the email address you have provided during your registration. 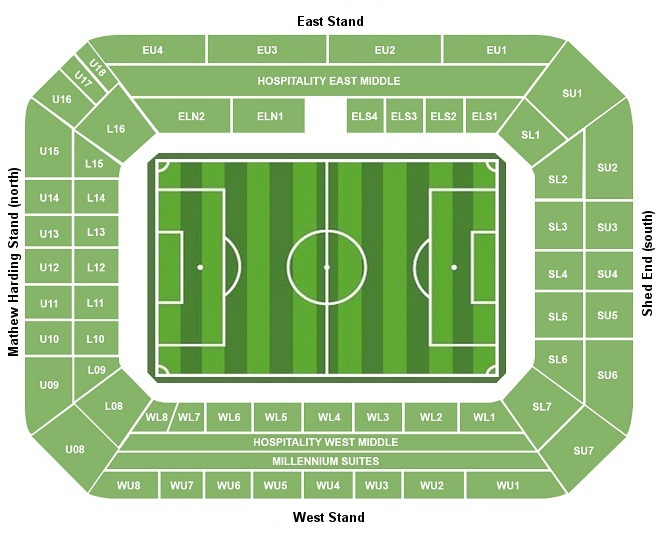 The Shed End, the second short side, features a family section in the lower tier next to the away fans with the upper a tier for general sale. It’s not unusual to see adult fans on their own in the Shed End lower tier but that doesn’t mean you will automatically admitted to the ground if you try to enter on a family ticket unaccompanied by children. Disabled supporters are hosted in two of the stands. The Shed End, the short side which houses away supporters and the family section, also features a specific area for disabled supporters and their carer. This section of the stadium is accessed via the photographers and groundsmen tunnel. 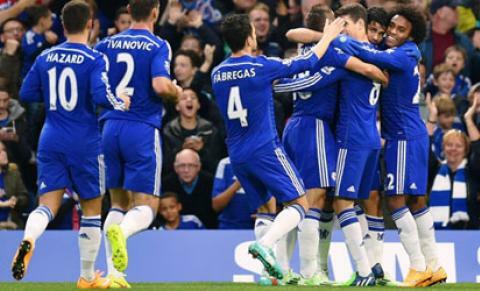 Chelsea were formed in 1905 and spent most of the next half-century flitting between the top flight and second tier. In 1955, they were crowned champions for the first time but were deterred from entering the following season’s Champions Cup by the Football League. They had to wait another decade for their next trophy – the League Cup in 1965 – but quickly established themselves as cup specialists, reaching four finals in seven seasons. The last was their first European triumph, beating Real Madrid in the 1971 Cup Winners Cup final. Things went wrong for Chelsea after that with the threat of bankruptcy a constant feature of the club’s story until Roman Abramovich took over in 2003. Having returned to being a club which moved between the top two divisions, success returned in the 1990s. The club lost the 1994 FA Cup final but began winning cups with 1997 FA Cup. They followed that with the League Cup, Cup Winners Cup and European Super Cup. The title eluded them until the appointment of Jose Mourinho in 2004. In his first season, he delivered the Premier League title fifty years on from the first triumph. He repeated the title win a year later and also won the FA Cup and two League Cups. Chelsea reached their first Champions League final in 2007 but skipper John Terry missed the crucial penalty as they lost the shootout to Manchester United in Moscow. The club’s first league and cup double came in 2010 but 2012 came their only Champions League win, beating Bayern Munich in Munich on penalties. Mourinho returned to the club in 2013 and once again delivered a Premier League title – as well as a League Cup - but as the title defence descended into farce, he was sacked. In 2016, former Italy head coach, Antonio Conte took over as Chelsea manager. Chelsea’s leading goalscorer, Frank Lampard Jr, is something of a rarity: a midfielder. Having made his name at West Ham United – where his father spent all but one season of his 19 year playing career – Lampard moved to Chelsea in 2001 for £11m. The move proved hugely unpopular with Hammers supporters. Lampard mastered the art of the deflected long-range shot, which became his signature goal. He holds the record for most Premier League goals in a game, scoring 4 against Aston Villa and Derby, and is the club’s leading scorer in the FA Cup. 19th May 2012, Allianz Arena. Chelsea, guided by caretaker manager Roberto Di Matteo, reached the final of the Champions League by beating Barcelona in the semi-final. Their reward was to face Bayern Munich in Munich. Bayern were overwhelming favourites and should have been clear of the Blues by the time Thomas Mueller broke the deadlock with seven minutes to go. Five minutes later, Didier Drogba equalised with a header, sending the game into extra-time. Former Chelsea star Arjen Robben had the chance to win the game for Bayern Munich but his penalty was saved by Petr Cech. The game went to penalties. At 3 – 3, Cech tipped Schweinsteiger’s spot kick onto the post. Didier Drogba slotted his home to bring the Champions League to Stamford Bridge. Twitter – https://twitter.com/chelseafc Instagram – https://www.